HG Tackles Ice-Cream Confusion & Food-at-Work Woes! Now that summer's here, I like to eat vanilla ice cream with berries. But I get so lost with all the different types of ice cream in the freezer case at the store -- light, churned, no sugar added, fat free, etc. What do you recommend for a treat that's not fattening? Thanks! It's confusing out there in the world of ice cream... So many different claims splashed across those cartons. And many of the claims can be misleading. "Made with real fruit" sounds good, but fruity ice cream can still be loaded with fat. And "no sugar added" is really only helpful if you're specifically watching your sugar intake -- the ice cream can still be high in calories. The words "light" and "reduced fat" will lead you in the right direction, but you really have to grab that carton of ice cream, turn it around, and read the nutrition info on the label. I suggest looking for ice cream with around 130 calories and 4 grams of fat per 1/2-cup serving. 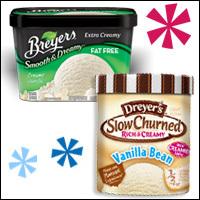 My all-time favorite light ice creams are the varieties in the ever-expanding Dreyer's/Edy's Slow Churned Light line. They have half the fat of regular ice cream and one-third fewer calories. But more importantly, they taste incredibly delicious! The fat-free types have fewer calories, but you're limited when it comes to flavor options, and the light stuff is a lot richer in taste. However, I do think fat-free ice cream is fantastic when it comes to keeping calorie counts down in decadent recipes. My pick for the fat-free stuff is the Breyers Smooth & Dreamy Fat Free lineup. BTW, I love that you bulk up your ice cream bowl with fruit -- I do that too! Sometimes I even skip the ice cream altogether and top a bowl of berries with Fat Free Reddi-wip -- fewer calories, extra fiber from the fruit, and you get that sweet 'n creamy fix... Happy spooning! I work in a restaurant, so I'm around food ALL the time. I cannot stop nibbling on stuff, and those calories add up. Any ideas as to how I can curb the habit? 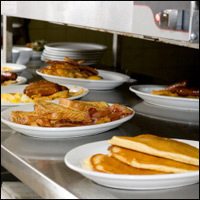 Don't go to work on an empty stomach. Even if the food available during work hours is free, it's not worth it. Eat a filling meal beforehand, but nothing super-heavy (especially if you'll be running around a lot). If you're in a rush, a light frozen entrée is a good choice. (Check out this HG frozen-food review for some great picks.) You can even bulk it up with a bag of microwavable veggies. Keep mints/minty items on hand. Not just because pleasant breath is nice for your customers, but also because those tortilla chips or breadsticks won't seem so tempting if you have a minty mouth. If you're around customers, I wouldn't suggest chomping on gum. Instead, try rinsing with mouthwash right before your shift. Stay hydrated. If you don't drink enough water, your energy level will likely drop, which means you'll be less productive at work. And in your dehydrated daze, you might confuse thirst with hunger and make a poor decision food-wise. Squeeze a lemon, lime, or orange slice into your H2O to zazzle it up a bit. Pack a snack. This is especially helpful if you work a long shift without a meal break. Make sure you pick something that'll help stave off hunger, like jerky, some light cheese, a banana, a filling snack bar with protein and fiber, or a 100-calorie pack of nuts. For more snack ideas, check out this snack-tastic email! Good luck; I hope you make a lot in tips! Ooooh... Today, June 22nd, is National Onion Rings Day. Celebrate with one of our latest creations or whip up the original Lord of the Onion Rings!